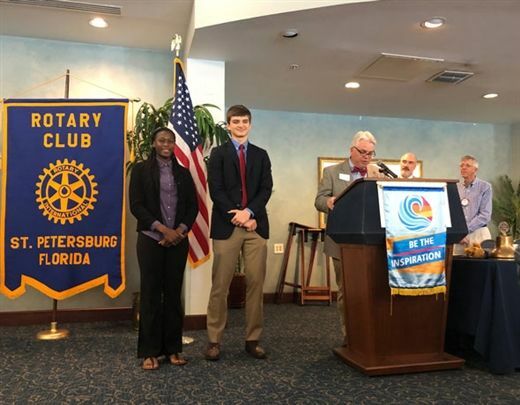 The St. Petersburg Rotary Club Youth Awards were established in 1938, to honor outstanding high school seniors in our community. Both Charger honorees exemplify our school’s core values of Respect, Responsibility, Integrity, Knowledge and Compassion. Renice Dacres ‘19 joined Shorecrest in ninth grade from Academy Prep. She comes from a proud family that encourages hard work and instills confidence as well as a vibrant sense of humor. In her four year career at Shorecrest, she has progressively challenged herself, taking on more difficult curricular choices as her high school years progressed. One colleague aptly described her as having a “humble hunger” for academia. She may stay after class to ask questions and to seek connections from what she learned to the real world. Renice has earned spots in honors level classes, including Shorecrest’s Center for Medical Sciences, where she has excelled in her understanding of human anatomy and physiology and has even branched out to take on an independent study in the field of nutrition. What our community especially admires about Renice is her unwavering positive attitude and contributions to our school community. When we have needed our students to be present for events and service projects, we have always been able to count on Renice to be there with a smile and a genuine sense of purpose. It is no wonder that she has been awarded Outstanding Citizen by our faculty. We at Shorecrest will all miss Graham’s unwavering inquisitiveness and quirky sense of humor. One unique connection between our two recipients is that both Renice and Graham were selected as All Stars in The Pinellas County All Star basketball games. Please congratulate Renice and Graham on their deserving awards from Rotary Club of St. Petersburg!